Russia, first half of the XVIIth century - 1662. Gold, precious stones; casting, chasing, carving, enamel. The elder son of Alexey Mikhailovich and his first wife Maria Ilyinichna Miloslavskaya. 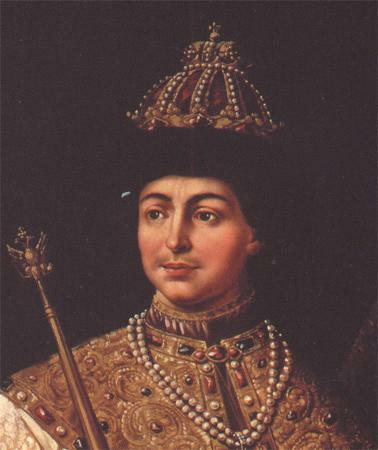 Fyodor Alexeevich Romanov was crowned in 1676 by Patriarch Ioakim, no changes were added to the ceremony. In the Assumption Cathedral of the Moscow Kremlin the head of the Russian Orthodox Church crowned the Tsar with the Crown of Monomakh, barmas, the cross, the golden chain, gave him the scepter and orb. Belonged to Tsar Fyodor Alexeevich. 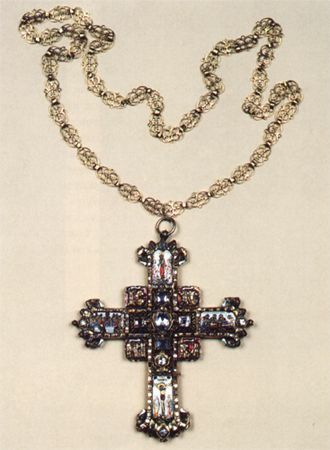 This is the only item survived from regalia of Tsar Theodore Alekseevich – the elder son of Alexis Mikhailovich. On the verso of the cross there is an image of a heaven protector of the Tsar Theodore Stratilates. The figure of the Saint, floral pattern around it, as well as religious scenes on the obverse of the cross are executed in bright shining colours, which make all the compositions similar to a multicolour shining mosaics.